Eggless Vanilla Cupcakes: I’m A Poor Froster Of Cupcakes. Buttercream frosting is my weakness. Sometimes I’ll buy a cupcake just to eat the frosting. This was one of those instances when the lament for frosting was greater than the need for cake baking. I know I do stupid things like eating chocolate chips out of a bag, but just making a batch of frosting for the sake of licking the bowl clean would just make me a freak of sugar. So I had to make some cupcakes which could be frosted. Being Indian, and living in India, I often entertain guests who are pure vegetarian and do not consume eggs- even in ‘hidden’ form like cake, cookies and brownies. And some members of my family observe a pure vegetarian diet on certain days of the week. I tried some eggless baking earlier, which was so-so…didn’t turn out so great. So factoring all this in, I knew it was time to learn and practice a new eggless cake recipe. For great vegetarian recipes and variations, I often turn to Anushruti’s blog. I made her eggless chocolate brownies for a friend’s daughter’s birthday and the whole family loved them. For these cupcakes, I used her eggless vanilla cake recipe, with the only tweak being in one ingredient- the yogurt. The recipe calls for plain, I used vanilla flavoured Danone yogurt because it tastes nice. And I worked with this yogurt in an earlier cake recipe and it turned out well. The batter, like Anushruti describes, is a little looser than regular cake batter- and so velvety smooth! I must admit here- I have never frosted a cupcake before. I haven’t frosted much anything. I didn’t think it would be that hard- since I was doing a home-style cupcake- but boy, was I wrong. You need to move deftly around the side of the cupcake so that you don’t accidentally sever bits off. I watched this video, where the YumSugar team goes to the famous Magnolia Bakery to learn how to create the signature Magnolia swirl. I tried mimicking the movements, but my swirls just ended up looking like strange bumpy imperfections, so I took a butter knife and smoothed down the bumps and made an X. Because X marks the spot and all that. And also because it was the only pattern I couldn’t screw up. Badly. Keep a cupcake tray aside, greased or lined with paper liners. In a medium-sized bowl, combine the flour, baking powder and baking soda well, and sieve everything once. In a large mixing bowl, beat the butter and Milkmaid until well incorporated, about a couple of minutes. Add the vanilla yogurt and beat some more. Pour in the milk and vanilla extract and beat well till everything is combined. Fold in the dry ingredients and scrape down the sides of the bowl with a spatula. Beat everything for a few minutes longer until the mixture is smooth and devoid of lumps and bubbles. 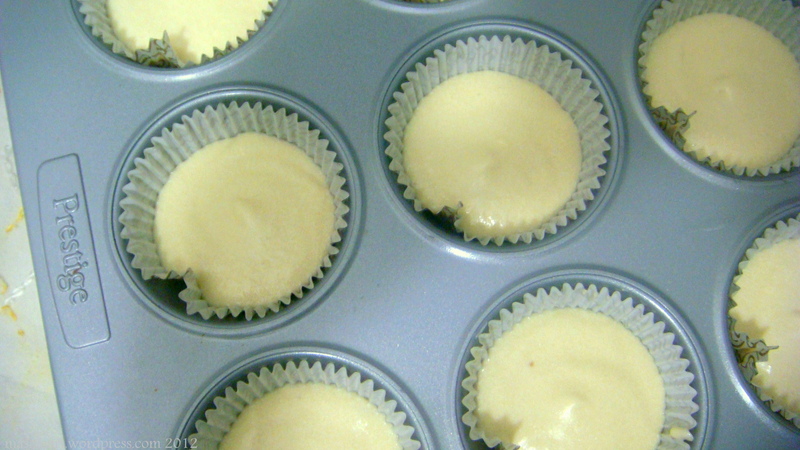 Pour the batter into a cupcake tray lined with paper liners and bake for about an hour at 150C. I kept checking on mine after 45 minutes! 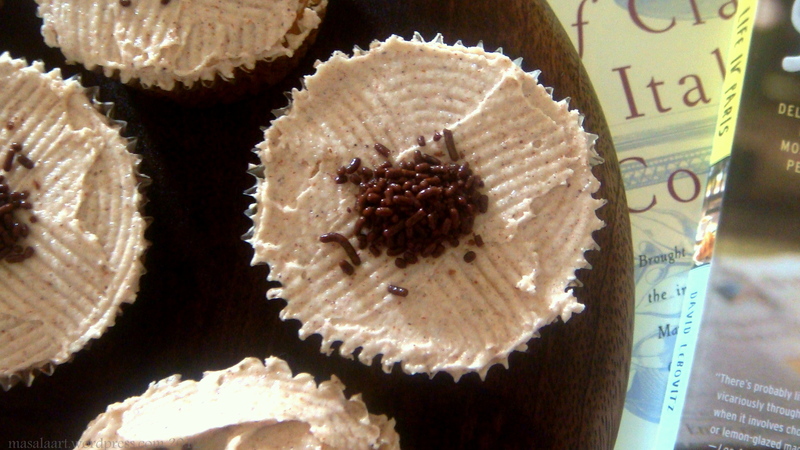 Beat the butter, sugar and cinnamon in a bowl until you get a smooth frosting which can be spread over your cupcakes. You may have some left over. Even though the icing looked like it was done by a Gremlin, these tasted pretty nice. The cupcake, as you can see, was very light and airy, but nice and spongy as well- perhaps the condensed milk gives it that bit of elasticity. Very versatile indeed, especially if you can frost like a pro!! I also photographed the cupcakes atop my latest acquisitions for my bookshelf: David Lebovitz’s The Sweet Life In Paris, and The Essentials of Classic Italian Cooking by Marcella Hazan. DL’s book is a must-have on any foodie’s shelf, and it has been so strongly recommended by other bloggers that I had to add it to my collection of food writing. And Hazan’s book is a wonderful repository of Italian food and cooking- from how to tell good Balsamic vinegar from one that is merely ok; to the best way to handle basil and pages and pages of illustrations and authentic Italian recipes. The illustrations are really wonderful; I highly recommend this book if you love Italian cuisine and want to learn more about it. I was being all amateur and thought that by placing the cupcakes on the books, I may be able to divert some of your attention away from the hideousness of the frosting. Because on this blog, I like to celebrate the hits and misses!! Is there anything better than buttercream? I don’t think so. I think not. Buttercream is so warm and fuzzy and yummy. I’d choose it over a ganache frosting anyday! Looks don’t matter; just the taste! I am glad there are more foodlovers out there who share that opinion. As long as it tastes good, it shall be eaten! Awwww I can’t believe you’ve never frosted a cupcake! I’ve been doing it since I was little so I guess I never thought about it, but you did just fine. X does mark the spot. Plus you can hide everything with sprinkles. Yeah!! Thanks Heather!! Yeah well, I grew up more as a spice-tempering kinda gal and not a cupcake froster. My mother was never big on baking- but she worked well with spices. And I shall keep that in mind-using sprinkles to hide flaws!! the frosting looks super cool. I am a frosting person too. Same pinch! and you know what!!! I am reading DL’s The Sweet Life in Paris too!! how cool is that and enjoying every bit of it as well. Frosting is the best part! And wouldja believe it- I finished the book only YESTERDAY. I abandoned it in between. Now I must make some of that choux pastry!! Thanks Prerna! Sorry it took so long to reply- I have just been away for a while. Not exactly been around myself my friend 🙂 Great to have you back on the circuit. Looking fwd to more from u. Thanks Prerna! I know how it is…sometimes we just end up going under even though we don’t want to! !